This is not to cast blame but in a sense of wonder at how times, and I, have changed. Wonder that life holds such amazing surprises, unexpected twists and undreamt of paths, and that I am now able to enjoy them. If someone had told me ten years ago that I wouldn’t get married to Jaye, I wouldn’t live in England in domesticated bliss and I wouldn’t be a mad cat woman, I would never have believed them. If someone had told me three years ago that on a future anniversary of the day I got my heart well and truly broken I would be relaxing on a tropical beach having snorkeled all morning from my rented boat, I would have laughed (or more probably sobbed) in their face. I sometimes wonder where I’ll be and what I’ll be doing in the years ahead as my life continues to be the most amazing journey I have ever made, but actually, it doesn’t really matter. As long as I continue to take the wonderful opportunities that are presented to me and live a useful life, I don’t mind where I am or what I’m doing, as long as I am happy. And I’m glad I found that out for myself; that nobody told me. Burmese Buddhism is unique, blending the ancient, authentic Theravada school with the Nat worship (more linked to natural spirits) of the hill tribes and Hindu-Brahmanism of early traders to the country. Most religions, consider pilgrimage to be an essential part of the road to enlightenment but in Buddhism, it is not a duty, although Buddha emphasised its importance as a means of travelling to a higher state and purifying karma. 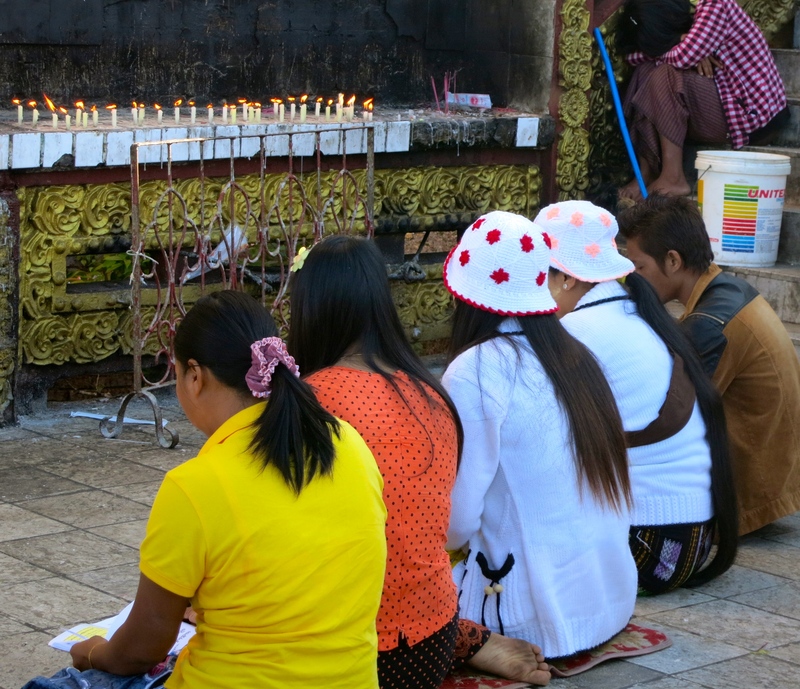 And in Myanmar, pilgrimage to one of these holy sites is a must. In fact, it is often a regular family excursion with three (or more) generations attending a site and praying together. Babies are carried, toddlers herded and grandparents slowly escorted up and down the many steps. All this is done in quiet reverence making these sites a haven from the constant hubbub of everyday life. Voices are hushed, raised only when chanting prayers. Shwedagon Pagoda is probably the holiest site in Myanmar because it has the relics of three Buddha enshrined in its summit. One of these is some hair from Gautama’s head. As legend has it, these hairs emitted a brilliant light that radiated to all corners of the world and cured the sick. 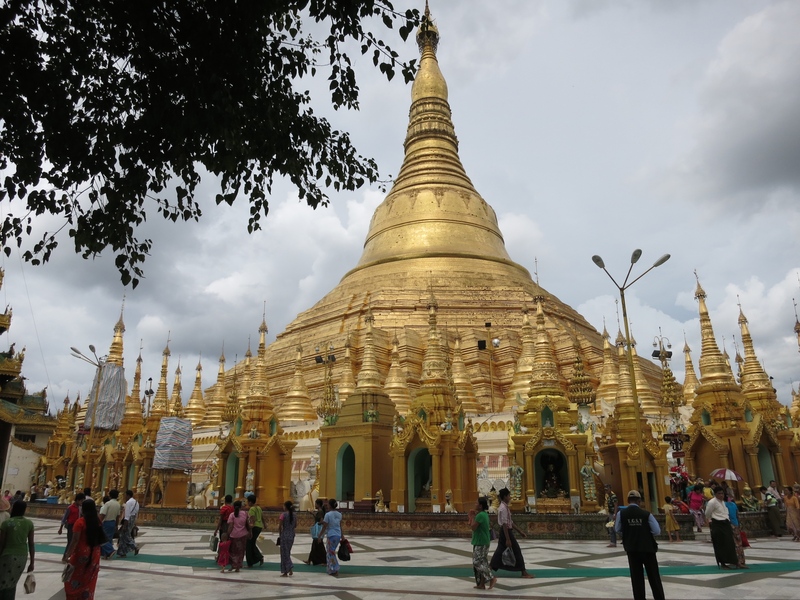 The site of this miracle was Singuttara Hill, where Shwedagon Pagoda resides. Shwe is the Burmese for gold and Dagon means three hills, therefore perfectly encapsulating the legend. By day or night, in sunshine or in rain, it seems to hover above the city and glow. Even when covered in scaffolding it is lit up to be a beacon to all that is holy. It is also huge! I got lost the first time I visited because it has four stairways leading to it and I foolishly did not take note of which one I had entered by. It also contains numerous gilded Buddha including a bejeweled Jade Buddha. It is sumptuously faded yet still very impressive. It is also a great place to sit and contemplate life as you watch the pilgrims pay homage to their chosen shrine, be that their cosmological animal (a bit like our star signs) or another of the multitude of significant images. Offerings cluster around statues or in the base of Bodhi trees. Flowers, paper umbrellas, baskets of fruit, jasmine wreaths, even full meals lovingly cooked and left in homage. Candles are lit, water is often poured, and, at some point, each person will kneel, keeping their bare feet pointing away from the shrine as a sign of respect, and bow and pray with graceful reverence. 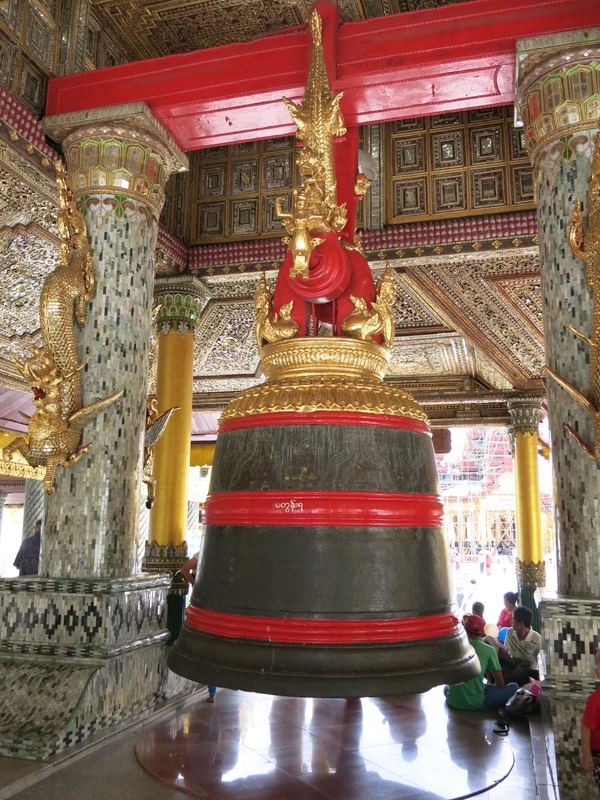 Once homage is paid they may then strike one of the many, huge brass bells that are so much a part of Buddhism, resonating soulfully around the temple to release their prayers and encourage mindfulness. 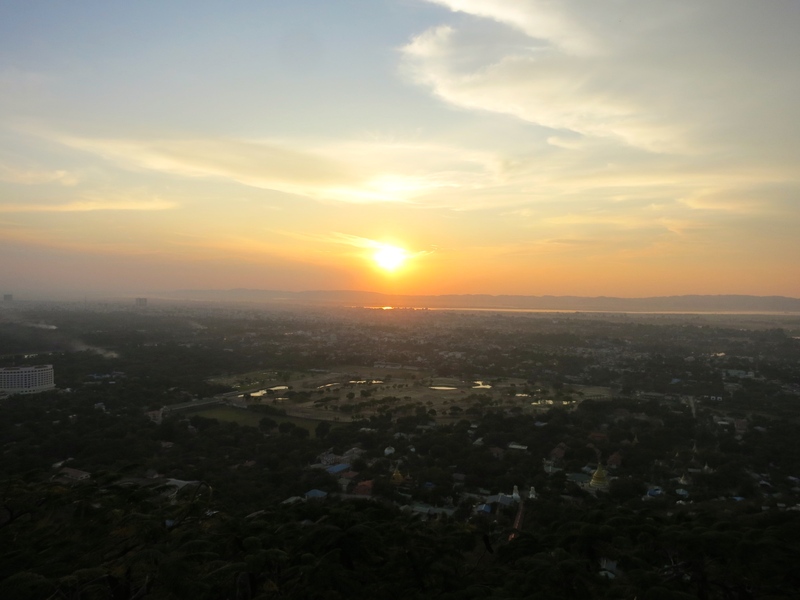 Mandalay Hill, the setting for glorious sunsets after a day of temple visits around the area, also has its pilgrims and offerings, shrines and prayers. 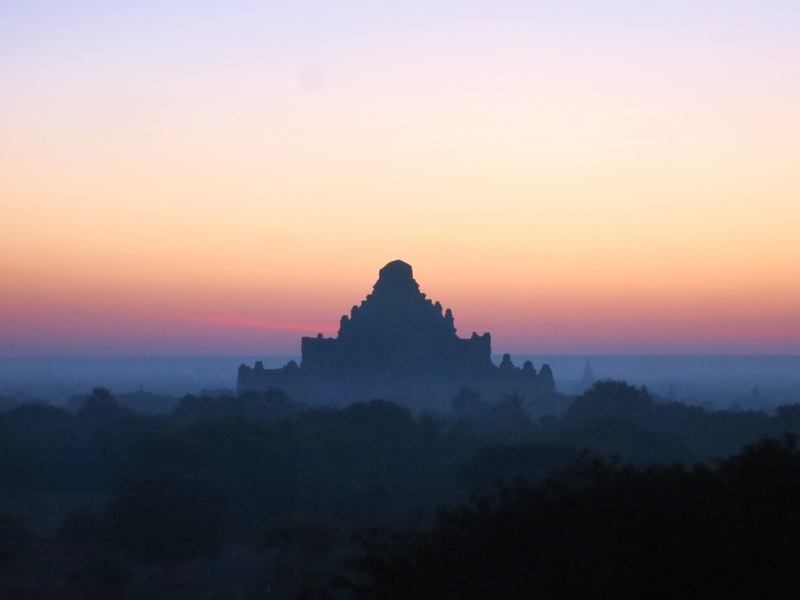 King Mindon founded the City of Mandalay in fulfillment of an ancient prophecy by Gautama Buddha that on the 2,400 th anniversary of his death a metropolis of Buddhist teaching would be built at the foot of the hill. Now, it is also a mecca for Burmese students who wish to learn English. Sitting in the temple at the top of the hill, waiting for sundown, foreign tourists are often surrounded by eager students desperate to practice their English pronunciation. Whether these foreigners are British, American, French or Dutch, English is spoken as the country reflects upon its old colonial roots and looks towards new opportunities in the West. The temple that crowns the top of Mandalay Hill is colourful and mirrored, glinting and glowing as the sun sets over spectacular views of Mandalay, the Ayeyarwady rice fields, and the Shan plateau. It has a majestic feel to it, overlooking as it does, the now ruined Royal Palace and it was a wonderfully peaceful experience to finish off a lovely day. 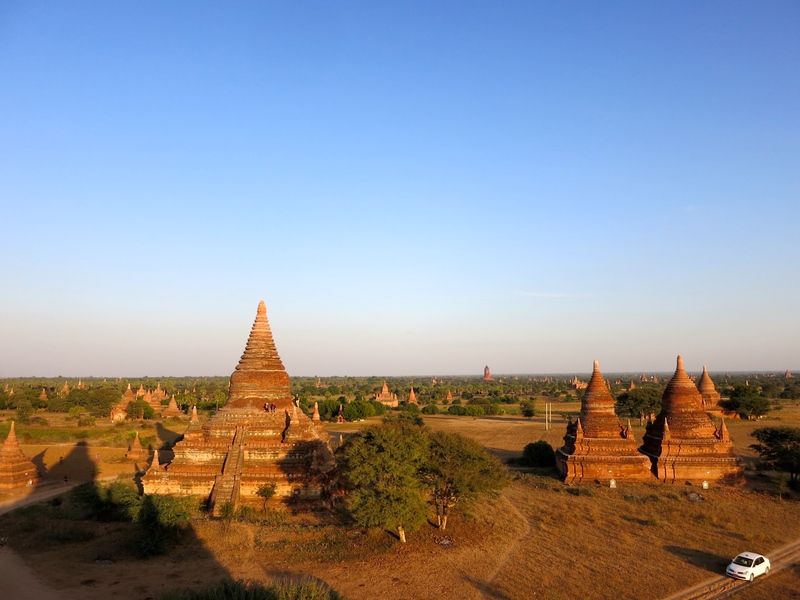 The Lost City of Bagan is another place altogether although just as inspiring as Shwedagon and Mandalay Hill. A 50 sq. km plain of brickwork stupas, hailing from the medieval era offers you approximately 2,200 temples, pagodas, kyaung and other religious sites to explore. There is less gold and more dust here, yet it has a more mystical feel about it that makes you love it even more. Shwezigon Pagoda is more like the temples of Yangon and Mandalay with, as the name suggests, plenty of gold, and surprisingly good Wi-Fi! Ananda is a dusty white temple with a gold stupa that is considered a masterpiece of Mon architecture, with labyrinthine corridors, tall teak Buddha images and illustrated Jutaka tales lining the walls. Dhammayangyi’s ruinous silhouette reminded me of the Great Pyramids of Cairo yet it is the best-preserved temple in Bagan with beautiful brickwork and masonry and a vast array of puppets hanging from a tree near the entrance. Truth be told, at times it was difficult to remember which was which as we explored the vast area, but I know that, for me, this pilgrimage was by far the most significant. I loved the feel of Bagan, and the people I met there. Golden Rock Pagoda is quite a spectacle. 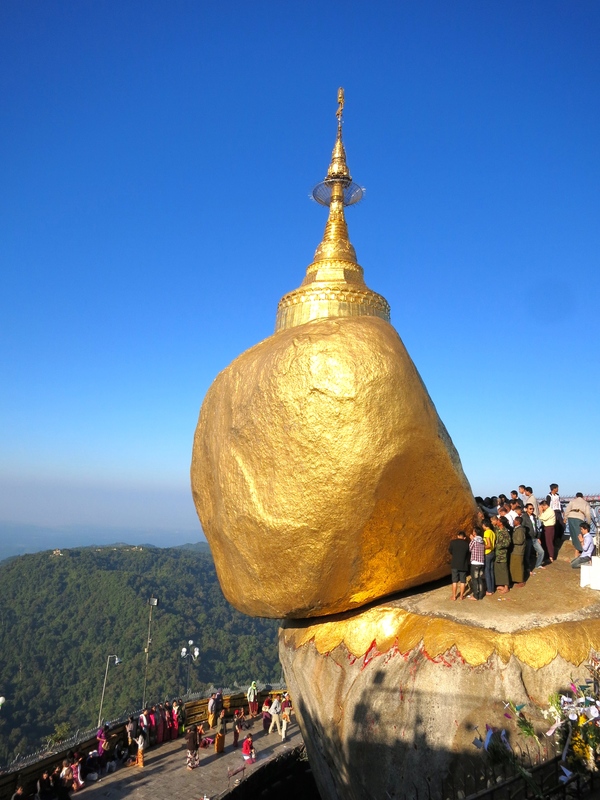 The small (in comparison to the other religious shrines) 7.3 meter, gold covered rock is purported to be held in its precarious location by the hair of the Buddha. Legend has it that the hair was given by a monk on the proviso that it was installed in a rock the shape of his head. By magical means the king, Tissa, was able to fulfill this request and brought a giant rock from the seabed up to the mountain, an epic task. The effort it took to visit this site was also by far the most arduous with noisy night buses and a very uncomfortable open-topped truck amongst our methods of transportation, but these were still preferable to the hefty 7km hike up the mountain that the devout can take. I visited in the height of the season, with hundreds of visiting families and the odd foreigner milling around the mountain. Sadly, this resulted in the feeling I was attending a theme park rather than a spiritual place. Parts of it were certainly very touristy. The village at the bottom of the mountain, Kinpun, where most of the accommodation is, had a very makeshift feel about it and the stalls of souvenirs that cluttered the steep steps along the mountain ridge were a Burmese Blackpool. The open-topped truck, particularly on the return journey, was like a roller coaster that never quite dropped but kept you teetering on the edge of the abyss that fraction too long! However, walking around the rock itself was quite a moving experience. As is often the case in Buddhism, women are not allowed to go to the sacred rock itself or apply gold leaf to it because, according to another legend, the rock is a female that only men can touch it (! ), but they are able to pray nearby. Candles and offerings fluttered in the chill morning air as bundled up pilgrims made their prayers beneath the towering pagoda, with their backs to the forested mountains around them. Swifts dotted the sky and the early morning sun gave the rock a rich glow that is only enhanced, so I’m told, when viewed at sunrise or sunset. It is peaceful in a more natural way than Shwedagon or Mandalay Hill and gives a more concentrated feeling of worship than Bagan but I feel it needs to be experienced at a quieter time of year to be truly appreciated. Pilgrimages are a way to gain merit in the afterlife but I like to think that actually I have gained more from these experiences over the last month than that. Myanmar has some beautiful religious sites and provides some memorable adventures in the exploration of them that truly brings out the wanderer and the wonder in me.